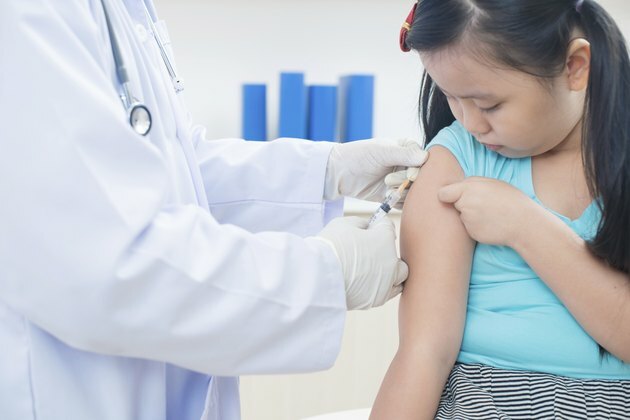 Can Children Get Rashes from Vaccinations? If your child develops a rash following immunization, don't panic. It is not a sign that your child has contracted the disease against which he has been recently immunized. Vaccines can cause side effects. These are usually minor and last a few days. Rashes are a common side effect suffered by some children following immunization. Varicella vaccines and measles, mumps, rubella, or MMR, vaccines most commonly cause rashes. This is due to the fact that these vaccines are live vaccines, meaning that they contain live weakened or attenuated viruses. According to the Centers for Disease Control and Prevention, a mild rash occurs in 1 out of 25 people after immunization with a varicella vaccine. This chickenpox-like rash usually shows up one to two weeks following immunization and is not considered contagious. The rash normally consists of approximately 10 spots resembling chickenpox. According to the CDC, the MMR vaccine tends to cause a rash in approximately 1 in 20 children following immunization. This reaction tends to occur 6 to 10 days following vaccination with the MMR vaccine but can develop any time between 3 to 28 days post vaccination. The rash usually lasts one to two days. This measles-resembling rash can be found anywhere on the body but is commonly found on the neck and chest areas, and may become raised and bumpy. Most vaccines can cause redness at the injection site following immunization. This reaction is common and will likely disappear in a day or two following the injection. Another reaction to look for is any swelling of the face or lips, difficulty breathy or hives and an itchy rash on the skin. These are symptoms of an allergic reaction. Although extremely rare, any vaccine can cause a severe allergic reaction in people with an allergy to any component of the vaccine. This reaction can occur in as little as 10 minutes following immunization. People experiencing this type of reaction should seek medical attention immediately. Along with rashes, other mild side effects are common following immunization. A common reaction that sometimes accompanies rashes is a fever, which can be present with or without a rash. Local pain and swelling at the injection site is also common following immunization with any vaccine. If you are concerned about any of the side effects possibly caused by immunizations, contact your family physician.